"14th Annual Pottery in the Park Arts Festival - October 3-4, 2015 - 10am - 5pm. 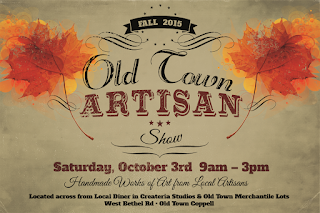 Over 50 artists - pottery, jewelry, glass art plus more hand crafts available for sale - indoor & outdoor booths. Wheel and hand-building demonstrations. Where you'll say, "No way. That is so cool". Hands on demo: Purchase bisque ware and yes, you glaze it yourself. Then we will raku fire it while you wait. Tour the facility & talk with the artists. Food trucks. Free admission/free parking/free to have a good time. Bring a print out of this ad & get one free raffle ticket!" "The Aledo United Methodist Lord's Acre 2015 is a day of fun for the whole family which benefits local and global missions. Activities will include: Live and Silent Auctions, Live Entertainment, Food Trucks, approximately 40 Area Artisans and Vendors, Washer Tournament, 3 on 3 Basketball Tournament, Bingo, and a Huge Children's Area with games and inflatables, and the ever popular Country Kitchen. " "This is a Fundraiser and Benefit to raise money to help out Brooke and John Foster a father and daughter with the medical expenses they are incurring as Brooke is 16 and has Osteosarcoma which is a form of Cancer." "Craft Fair hosted by St Andrew Lutheran Church"
"The Ultimate Ladies' Day Out Experience! Shop from over 20 unique vendors, enter prize drawings, network with professional local women, Sip on delicious wine and enjoy snacks, and pamper yourself with complimentary and discounted beauty treatments!" Admission Fee: $10 includes wine, snacks, beauty treatments, prize drawings, and unique shopping!